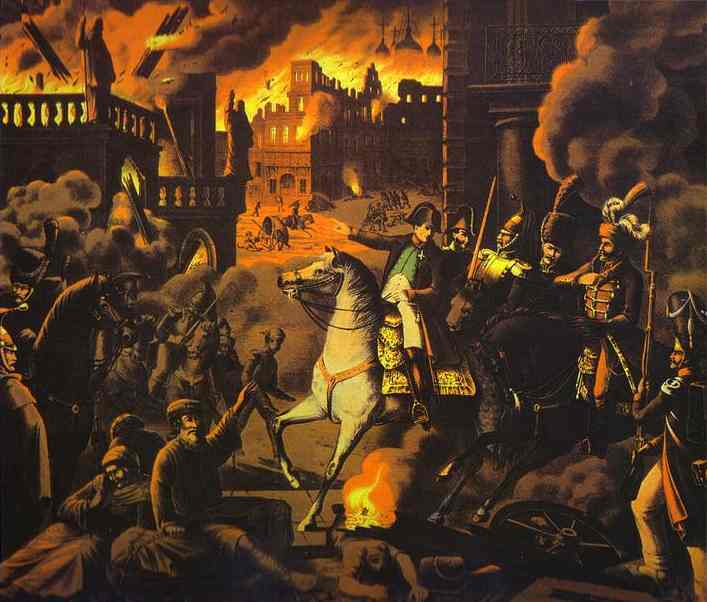 Napoleon at the burning of Moscow in 1812. What if the fire hadn’t happened? In view of all the alternate history about Napoleon, of which Napoleon in America is an example, it is worth noting that a prolific speculator about Napoleonic “what-ifs” was Bonaparte himself. Napoleon often posited counterfactuals, particularly when he was in exile on St. Helena. Here are some of Napoleon’s alternate history scenarios. Napoleon’s father, Carlo Maria Buonaparte (Charles Bonaparte), died of stomach cancer in February 1785, when Napoleon was 15 years old. Between 1803 and 1805 Napoleon gathered an army of 200,000 men on the north coast of France and built a flotilla of barges with the intention of invading England. He called the invasion off when his plan to gain temporary control of the English Channel failed. I would have offered you a constitution of your own choice, and have said ‘Assemble in London deputies from the people to fix upon a constitution.’ I would have called upon Burdett and other popular leaders to organize one according to the wishes of the people. I would have declared the [king] fallen from the [throne], abolished the nobility, proclaimed liberty, freedom, and equality. Napoleon also contemplated invading India. In 1812, Napoleon invaded Russia. He made it as far as Moscow, only to find that the Russians had evacuated the city. Fires set by Russian saboteurs then destroyed most of Moscow. Napoleon retreated without having attained a decisive victory. The failure of the Russian campaign is considered one of the reasons for Napoleon’s downfall. [If Moscow had not been burnt] I should then have held up the singular spectacle of an army wintering in the midst of a hostile nation. … On the first appearance of fine weather, I should have marched against the enemy: I should have beaten them; I should have been master of their empire. [Russian Tsar] Alexander, be assured, would not have suffered me to proceed so far. He would have agreed to all the conditions which I might have dictated, and France would then have begun to enjoy all her advantages. And, truly, my success depended upon a mere trifle. For I had undertaken the expedition to fight against armed men, not against nature in the violence of her wrath…. Peace, concluded at Moscow, would have fulfilled and wound up my hostile expeditions. It would have been with respect to the grand cause, the term of casualties and the commencement of security. A new horizon, new undertakings, would have unfolded themselves, adapted, in every respect, to the well-being and prosperity of all. The foundation of the European system would have been laid, and my only remaining task would have been its organization. On my return to France…I would have proclaimed the immutability of boundaries; all future wars as purely defensive, all new aggrandizement as anti-national. I would have associated my son with me in the empire; my dictatorship would have terminated and his constitutional reign commenced. On June 18, 1815, Napoleon was defeated at the Battle of Waterloo by a coalition of British, German, Dutch-Belgian and Prussian forces led by the Duke of Wellington and Prussian Field Marshal Gebhard von Blücher. I have already written about Napoleon’s general thoughts on the battle. Here are a few of his alternate history speculations. When Napoleon escaped from Elba and returned to France in 1815, his brother Joseph advised him to appoint their younger brother Lucien as governor of Corsica, which is where Napoleon and his family came from. Lucien would thus have been in that position when Napoleon was defeated at Waterloo. Emmanuel-Auguste-Dieudonné Las Cases, Memoirs of the Life, Exile and Conversations of the Emperor Napoleon, Vol. II (New York, 1855), p. 132. Las Cases, Memoirs of the Life, Exile and Conversations of the Emperor Napoleon, Vol. III (New York, 1855), pp. 164-166. Las Cases, Memoirs of the Life, Exile and Conversations of the Emperor Napoleon, Vol. II, pp. 186, 187, 192. As something of a gambler (at least on the battlefield), Napoleon ought to have known that there are three horses that never win: their names are Would’ve, Could’ve and Should’ve. He’s not just writing alternative history here, either, but alternative geography as well. If he really thought that England was ‘abounding in plains’ he was in for a rude shock trying to manoeuvre 200,000 men through the steep, wooded hills of Sussex and Surrey. Thanks for this excellent point, Matt. I think Napoleon had a number of misconceptions about England (see, for example, his 1815 letter to the Prince Regent). Great article. I didn’t know he played with alternative scenarios himself, but there are so many events in his life that could’ve ended differently. What if he didn’t survive the fall from his horse at the battle of Arcola? Or the coup with the exploding chariot? I like playing with these alternate scenarios myself, but I make them more absurd. What if Napoleon and his family lived in present day Europe? 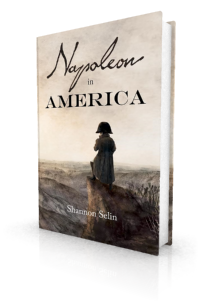 As a fellow non-fiction author and as an admirer and devotee of Napoleon, I thoroughly enjoyed this offering from you, Shannon. Thank you. Thanks for your kind comment, Derek. I’m glad you liked the article. Four days would have brought me to London. In a country like England, abounding in plains, defence is very difficult. I have no doubt that your troops would have done their duty, but one battle lost, the capital would have been in my power.